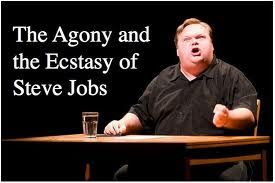 Mike Daisey is one of my heroes. "PowerPoint is a tool designed by Microsoft, whose motto should be, 'Building Tools That Do Stuff We Can Already Do.' Because the point of PowerPoint is that it enables people who are in the same room to communicate with one another. "As you can tell from the form of my theatrical presentation, I believe we have a tool that does that already: it’s called the human voice. It’s built-in and it hardly ever crashes. "But why would we want to talk to one another when instead we can use PowerPoint with all its features - like the clip art? AARRRGH…the clip art makes my eyes bleed! And the fonts! Ohhhhhh, they use all the fonts! Comic Sans? There’s nothing comic about Comic Sans! "There’s a pause. And then the click-er says: 'The plant uses thirty thousand gallons of water every day.'!!! And then nothing happens! Until and unless—I manually nod. I have to literally go,(big, exaggerated nod) “Mmmmmm . . . ” (pause) And only then will they…clllliiiiick, and another line of text appears. For two days last week I sat in a huge room of regulators, utility representatives, federal officials and other D.C. types like myself to hear an in-depth discussion about the future of electricity in America. In a grand experiment known as the National Electricity Forum (sponsored by DOE and NARUC), speaker-after-speaker talked about everything from microgrids to energy storage. I can't lie, the conversations are of deep interest to me because of the type of work we do here at PCG. However, the debate at this conference left me frustrated. The theme was "Visualizing the 21st Century Electricity Industry." We love to visualize here in Washington. Too bad we don't like to do anything with that vision. I watched as the U.S. Department of Energy cast a vision for the future, industry leaders shared barriers to getting it done, regulators wringed their hands about the cost to the customer and starry-eyed academics discussed obtuse ideas that may or may not ever gain traction. The problem with this type of discussion is that it isn't going anywhere. We are guessing what the future might be and not trying to shape it through a clear vision that is articulated with a clear message. When Kennedy stated we should go to the moon, the message was clear. The way to get there became clear because the goal was clear in the first place. The message at this conference was, "we will see." Great! And just how is that going to inspire. I don't really blame the conference organizers. I think it is indicative of the sometimes sad state of policy development in our country today. We are a people who will not set a vision until we are forced to do so from outside forces or an internal crisis. And so we plod on, making incremental progress with incremental ideas delivered through incremental messages. It makes me incrementally sad. Note: Andy is not always this grumpy, except for sometimes when he writes a post like this. Here’s a storyline that’s familiar, to the point of cliché. A big energy company “eager to plunder nature’s bounty in pursuit of profit” talks a gullible community into allowing a power plant that damages the environment , threatens public health and divides neighbor against neighbor. We’ve seen this film before, literally. Just plug in the words “nuclear,” “coal,” or “big oil,” and you’ll be able to come up with dozens of variations. But here’s a new twist. In a movie released this week, to rave reviews, the evil energy is . . . wind power. When I read the review in the New York Times, I almost laughed out loud, until I thought about the seriousness of the problem that it represents. Here we are, facing the great threats of dependence on unpredictable foreign countries for our energy supply and the impact of our fossil-fuel use on climate change, and we start opposing wind power. Every energy facility will run into NIMBY – and, it seems, into Hollywood documentary makers. And it may be that the wind turbines installed in the community of Meredith in upstate New York were not sited as sensitively as they should have been. But our goals of energy security and control of climate-change emissions will be all the harder if we all say Not In My Back Yard to every energy source.